Happy 4th of July Everyone! Time to party. I love David Lebovitz website he has some great recipes and lives in Paris too. How lucky can you get. Great image. Perfect, Eric! I needed a birthday gift for my foodie friend who likes to travel. Mission accomplished! Oooh my goodness. Chocolate. Sherbet. Two of my favourite things put together? Sounds divine. I know David and have taken many of his chocolate tours! What a great surprise to see him on one of my favorite sites. Oh la la ,my favorite things! Desserts,I never met one I didn't like, Paris,and nice American men who have turned French!!!! Er, I can't say the same thing about men that I said about desserts. I love the angle, the blackboard writing and background colours too - lovely pic! Phx, LOL! I love getting lost in the dessert too. Three great things at once! Writing, dessert, and Paris. How better could life be. Maybe David can help Eric get a book deal one day? Then we could have him make a dessert with an image of Eric signing his book on it. Ok, it's early, I'm tired. Happy 4th to my compatriots! BTW Eric, I love the "depth of field" shot! The "Tea Time" and Badoit bottles in the background look great. It's a surprise to see an American in Paris teaching anything about food! You are generous, and true to your nature, to feature him for our national holiday. Merci Eric!! David's blog is amazing and it is one of the only blogs[except for PDP of course]that I have continuously followed ever since the beginning; and not just because he also did time in the Bay Area..LOL!! Thanks Eric..good stuff!! I like the photo. Does David Lebovitz know the honor bestowed upon him -- serving as the symbol of the Fourth of July on PDP?!? Wow! The first time I went to France, it was for a six-week program in Paris. During that time, one of my goals was to try a different pastry every day. I'm pretty sure I met my goal! Some days I "had to" have more than one, because I wanted to have my favorite ("un gland" de la patisserie au coin du Blvd. des Batignolles et la rue de Turin) AND a new one "needed" to meet my goal. As far as I'm concerned, French pastries are the absolute best! 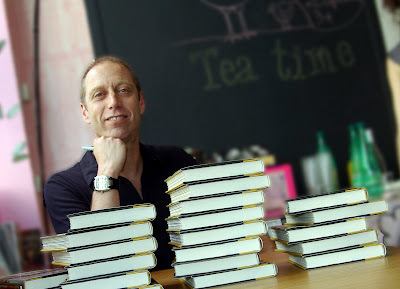 Nice picture of David Lebovitz. He is my favorite Chef et je l'adore. Il est talentueux et very amusant. The Fourth of July is dawning here where I am (well...the sun rose a while ago - I'm just rising now!). How sweet of you to think of us Americans! Thanks, Eric! Parisian heart: I spent my Jr. yr. abroad in Rome and ate cannoli more than once a day from the top of Italy to the bottom and I looked it by the time i left. Did anyone notice that Michael also qualified for the best of in my first comment? Well, Eric, you've done it again. I dislike cooking and never read cookbooks, yet, upon following your link, I realized that I've just spent an hour reading David's blog! I don't think my foodie friend knows of him and this will be a great treat for her. Thanks for the info! Now that's living the good life! Happy 4th, people! Time to go celebrate some more. Yay for David Lebovitz! I really like this portrait (and I hope the next photo was of all those books sold and signed!). If you like ice cream, be sure to buy his book "The Perfect Scoop" which is full of fabulous recipes, and very funny asides. Someday I'd love to take his Parisian chocolate class! This man is a menace. He almost ran me over on a velib. We can give thanks to the French people for their monetary and military support during the Revolutionary War. Merci Beaucoup! I am really surprised about the excellent job that you have made in this blog, which contains very important and amazing content about 4th of July, it allows everyone to express a variety of opinions.